What Is The American Football Made Of? What is a football made of? How much does a football weigh? Why does the football get bigger as the players get older? 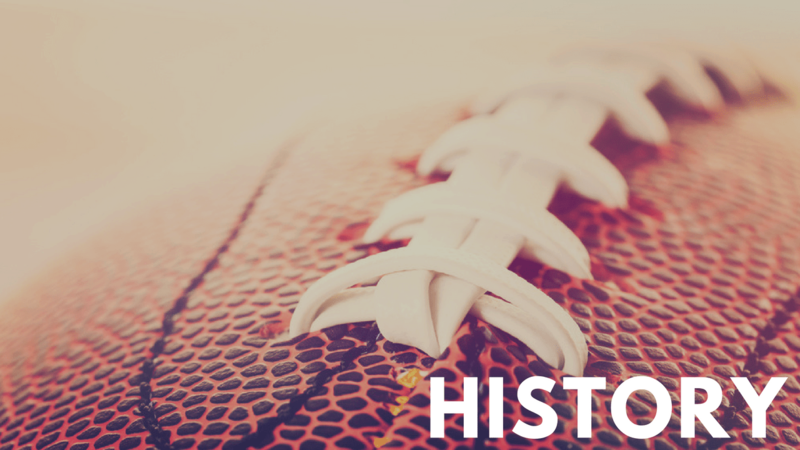 Let’s learn more about the history of the football and how it’s evolved over time. What Is The Football Made Of? The earliest form of the football was made out of pig bladders. They were easy to get a hold of and inflate. People started to cover the pig bladder with leather to form a ball that somewhat resembled what we know today. When rubber was first mass manufactured int he 1800’s, we start to see the football made primarily of rubber. The rubber football would then be covered in leather (much like the original) to ensure a better grip as the forward pass started to evolve. The football measures at a foot long (12”) and is shaped in a sphere. As mentioned above, as the forward pass started to evolve, so did the football. It was originally more rounded (much like a rugby ball) but then was reduced in size and shape to what we have today. In 1920, 28 years after William “Pudge” Heffelfinger became the first professional football player, the American Professional Football Association was formed, and the Spalding J5-V was named the official ball of the league. In 1922, the league was renamed the National Football League. And, in the 1930s, the Spalding J5-V began to be known as “The Duke,” which was the boyhood nickname of Wellington Mara, owner of the New York Giants. In 1935, the NFL shortened the ball’s short axis to between 21-1/4 and 21-1/2 in. The ball’s length was shortened that year to between 11 and 11-1/4 in., and the amount of air that it could hold was set at 12.5 to 13.5 psi. Its long axis of 28 to 28-1/2 in., however, did not change. These dimensions remain today, as does the ball’s shape, which has been called a “prolate spheroid” since 1890. The football size and dimensions have become a critical part of how the game has advanced. Because of the smaller shape – great pocket passers were born which still continue to push the ball down field today. As shown in the video above, footballs are seamed, stitched and softened inside out. A worker will then flip the ball inside out using his/her hands before it is filled with a polyurethane bladder. The footballs are then laced and re-heated so they can take the proper shape. As mentioned, football is a unique sport because the football must fit the hand size of the group that’s using it. To ask a youth athlete to push a pro football downfield is unrealistic. Middle school footballs are slightly bigger than youth footballs. They’re a bit longer and have less girth than a traditional college or NFL football. High School and college football’s share the same weight and circumference. The transition for a quarterback, center, running back or receiver going from high school football to college football is seamless because of these specifications. The NFL football is the king of all footballs. 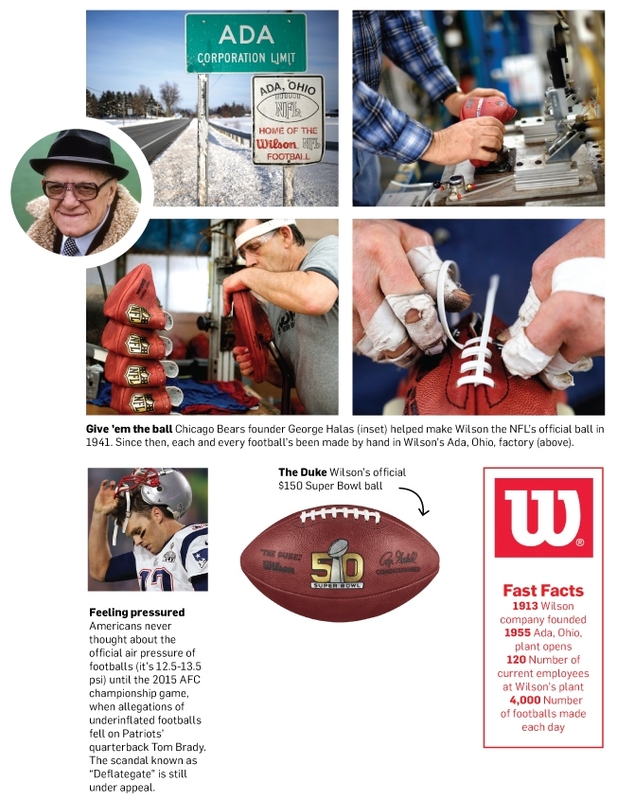 It’s official maker (Wilson ) has been making NFL footballs for 75 years. The ball is slightly bigger than the college football, however no drastic difference. The NFL ball making process is interesting. Wilson, founded in 1913, has a manufacturing plant in Ada, Ohio where it manufactures every football. Wilson currently staffs over 120 employees which helps make over 4,000 footballs a day! Laces of the football were originally used to seal the pig bladder that was encased inside the football. In today’s footballs, the laces are used for the quarterback to gain a grip and ultimately spin the ball down the field. The NFL football made and influenced all footballs around the world. Why Does The Football Get Bigger As Players Get Older? If a youth athlete (let’s say 7 years old) was trying to throw an NFL football, which weighs 15 ounces, they would need 2 hands. Not to mention, the ball would go roughly 5 yards from the limited amount of force behind it. Different youth organizations began to instill regulations on which size football should be used based on the hand size, as well as the ability to throw the ball down field for each level. Do you have any questions about the football? Do you think the NFL should use a bigger (or a smaller ball)? Should the ball be regulated to one size? Let us know your thoughts in the comment section below! Want to learn football on your mobile device? Download our mobile app available on both IOS and Android platforms today!